In Part One of this two-part series, we discussed propeller terminology and selection. In this second and final part of the series, we&apos;ll take a close look at some specific propeller problems and solutions, as well as computerized propeller scanning and repair. In many cases, propeller work is undertaken only when there&apos;s a perceived problem: poor performance, vibration, or grounding, for example. In other cases, “tweaking” or making small adjustments to the propeller can improve already acceptable performance or fuel economy. The load test performed during the sea trial involves running the vessel at wide-open throttle (WOT) for a few minutes. Not only should the engine reach the manufacturer&apos;s full throttle rating, which is often where maximum horsepower is achieved; it should also do so without overheating. In the fall, many vessels fail this test because the prop or hull is fouled by barnacles and other marine growth—a sure sign that these boats are not being used often enough! But interestingly, 60 percent of the vessels fail this test in spring sea trials with clean bottoms and props. The degree of failure ranges from 100 rpm below maximum (WOT) rating-while not ideal, usually considered acceptable-to several hundred or, in some cases, 1000-plus rpm below manufacturer&apos;s WOT ratings. Propeller removal using a tool designed specifically for prop removal. Notice that the nut is loosely screwed onto the shaft, to prevent the propeller from falling once it releases its grip on the shaft. 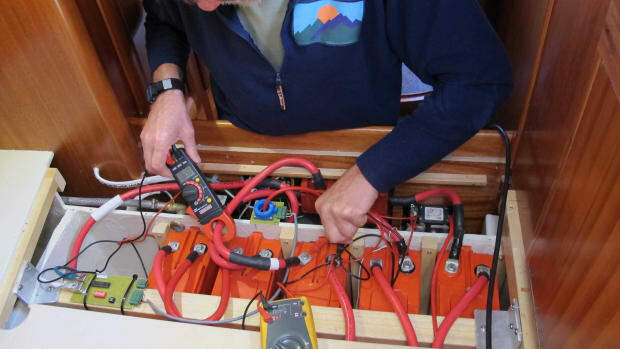 Armed with the results of the sea trial (assuming your vessel falls into the 60-percent failure category), you may think the next step involves a trip to the prop shop to reduce pitch-reducing pitch always equates to increased engine revolutions-and get the engine rpm back up where it should be. My response to this plan would be a "definite maybe." You see, by leaping to the conclusion that you have a prop problem, you may actually be missing a problem with your engine or running gear. In many cases, a vessel&apos;s engine fails to reach WOT as a result of an internal engine problem: excessive exhaust back pressure, misadjusted valves, fuel delivery problems, low compression, turbo malfunctions, or shaft misalignment. Taking pitch out of the prop will increase engine rpm, but performance and economy will continue to suffer. So before adjusting a prop to account for an under-revving condition, first ensure that your engine and drive train are in top operating condition. In my experience, the most common cause for this type of failure or diminished power is excessive exhaust system backpressure. The most insidious aspect of this failure scenario is that many boats operate in this mode new—straight from the factory. To determine-if this could be your trawler&apos;s engine problem, have an experienced mechanic perform a relatively simple exhaust system backpressure test. If your vessel passes and the rest of the engine and running gear are in good working order, proceed to prop adjustment to obtain the maximum rated rpm. If your vessel fails, however, you must correct the exhaust system problem before undertaking any propeller adjustment. 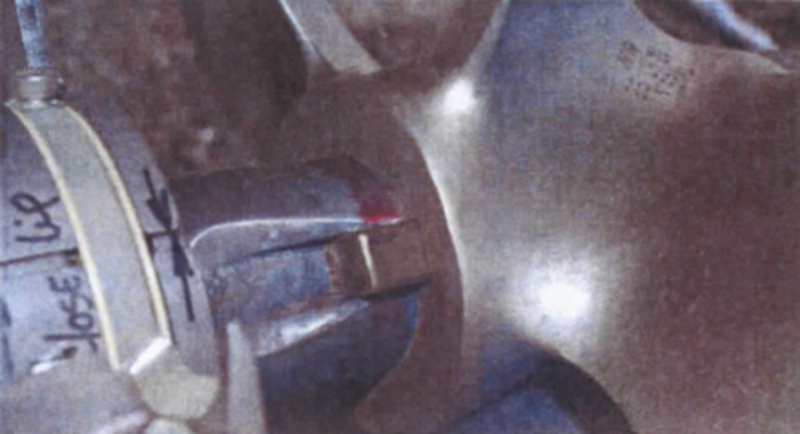 An example of the effects of propeller cavitation. Metal is removed, molecule by molecule, in this process. This propeller is either overpitched, under diameter, or lacking in sufficient blade area, or Buffers from some combinationof the three. Above: Propeller shaft cotter pins should always be made of stainless steel- This brass cotter pin has corroded nearly to the point of failure, and it&apos;s unlikely it could have retained the nuts and prop if they had become loose. If the pressure on the propeller blade is lowered enough-because the blade is overloaded, turning too fast, or damaged-the boiling point of the water may be reached. When this occurs, vapor, or partial- vacuum bubbles, form on the blade surface. Although this lowers efficiency of the blade by causing uneven pressure, the bubbles don&apos;t cause any trouble until they collapse, typically when they reach an area on the blade where pressure increases or returns to normal. Then, each bubble collapses or implodes violently, taking with it a few molecules of metal. Add all these molecules up, and it leads to a noticeable loss of material from the blade, which may result in a propeller imbalance and surface unevenness. Additionally, as each bubble meets its violent end, it creates some noise. Combine several thousand implosions per minute and you&apos;ve got a noticeable vibration, rattle, hum, or other unpleasant sound. The effects of cavitation-rough or cratered areas- are often noticeable on the blade back. 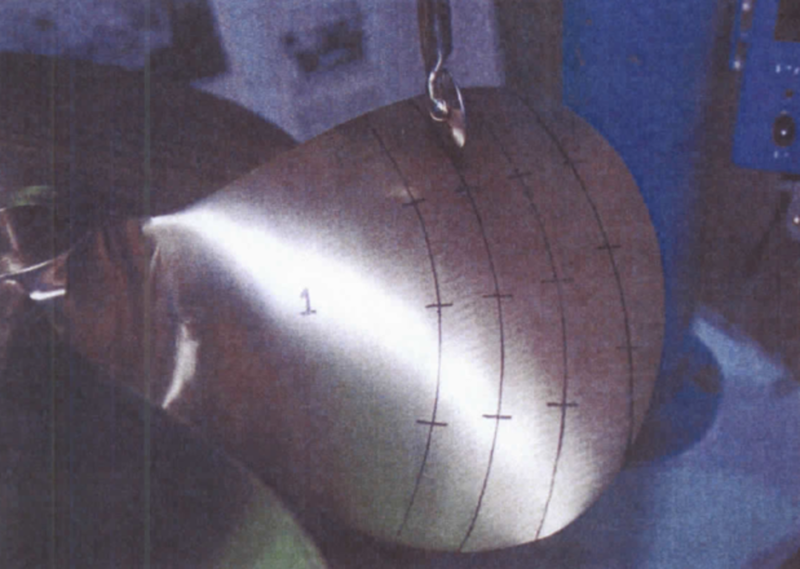 Fortunately, slow-turning propellers on displacement vessels are not usually subject to cavitation unless the propeller is overloaded or damaged. (The irregularity in pressure caused by blade damage can create cavitation.) Propellers on faster vessels-semi- displacement trawlers for instance-are frequently subject to cavitation because of high propeller loading that results from the vessels&apos; heavy weight and compromise hull shapes. I recall visiting a certain boatyard several years ago. (When I travel, I like to walk around boatyards, a practice my wife has yet to understand. "You don&apos;t get enough of these?" she always asks.) As I walked amongst the boats that were blocked, I heard an incessant clanging and banging. Intrigued by what this metalwork project could be, I finally homed in on the sound. To my shock and awe, I witnessed one of the greatest taboos in the marine repair world. A robust young man was swinging, for all he was worth, a large sledgehammer against the end of a 40-foot cruiser&apos;s shaft. Spun onto the end of the shaft was a large, brass "sacrificial" nut, used to save the threads-a little like applying protective wax to cars in a junkyard. I watched and cringed for a moment until he used my presence as an excuse to take a break-he was perspiring heavily. "What are you doing?" I asked. "Pulling the prop using a bang nut," he answered. Well, I thought, at least the tool is appropriately named. The idea was sound: Each hammer blow would drive the shaft and engine on its flex mounts forward a fraction of an inch. The mass of the prop would cause it to be left behind, eventually separating it from the shaft taper. The problem, however, is that each blow shortened the life of the thrust bearing in the transmission by 10, 50, or 100 hours. Thrust bearings are designed to absorb constant rather than shock loading of this sort. This is not the proper way to remove a propeller. Proper propeller removal is usually accomplished in one of two ways: with either a mechanical or a hydraulic puller. Occasionally, the application of careful, selective taps by an experienced professional, against the forward end of the propeller hub using a brass drift- never hitting the shaft or any other part of the propeller- may be used to remove a prop. Some propellers simply do not lend themselves to pullers because of the shape of the blade or number of blades. In such cases, the careful application of light blows in the right location is acceptable. In rare cases, mild heat may be used to help expand a propeller&apos;s hub and loosen its grip on the shaft. An ordinary propane torch may be used, but never an acetylene, or cutting, torch. The latter is simply too hot for this work, as it may change the metallurgical properties of the propeller alloy. With any of these methods of prop removal, it&apos;s best to leave one of the prop nuts loosely screwed onto the shaft threads, but not touching the prop. That way, once the prop separates from the shaft, it won&apos;t fall onto the ground, or your foot. Left: Machinist&apos;s bluing being applied to a shaft taper in preparation for tapping. Lapping is essential in order to ensure proper shaft taper-to-propeller bore engagement. Right: The results of the lapping procedure—the shiny areas indicate contact; where blue remains, however, insufficient contact has been made, and thus more lapping is required. Before you remove your own prop, or have it removed by a pro, take a few minutes to perform the following simple tests (after the boat has been hauled and blocked). Set up a ruler or just a thin, straight piece of wood trim aft of the propeller. You can use blocking material or a sturdy ladder as the mount for your pointer. Adjust the wood so it is as close as you can get it to the outermost tip of any one of the propeller blade&apos;s trailing edges, without making contact—about the thickness of a dollar bill. Then spin the propeller. None of the other blades should touch the stick, and none should be further from the stick than the first blade—that is, about the thickness of a dollar bill. Next, move the stick so that it is just beyond the tip of one of the prop&apos;s blades and carry out the same rotation. You should get the same consistency or "run out" This procedure, while primitive when compared to using much more accurate measuring tools, will give you (and the boatyard/propeller shop/shaft shop) an idea of any problems that may exist with the prop and shaft. If you want a more accurate assessment of the shaft and prop, have the boatyard perform a dial indicator test on both of these components. Once the propeller has been removed from the shaft, carefully inspect the taper-the cone-shaped portion of the shaft onto which the propeller fits-for pitting, scoring, corrosion, or other irregularities. The taper should be smooth and free of all defects. Finally, inspect the key-the long, rectangular object that fits into the shaft, locking it to the propeller via the shaft and prop keyways. (The keyway is the recess or slot into which the key fits.) The key should fit snugly into both keyways; however, it should slide in with little effort and tools should not be required for removal or installation. If it rattles or fits loosely in either the shaft or prop keyway, it must be replaced. A proper fit is essential for propeller security. The Prop Scan measuring system in action. The lines indicate the measurement radii—60 to 90 percent of the distance from the prop&apos;s center—each of which is broken down into four zones from edge to edge The number represents the blade, number one always being adjacent to the keyway. The correct procedure for installing a propeller calls for a considerable amount of attention to detail to ensure a proper fit. Begin by dry-fitting the propeller. This involves pushing the propeller onto the shaft without the key installed. Push it on by hand, as far as it will go and rotate it several times while holding the shaft stationary. Then, mark the shaft at the forward part of the prop hub, to record how far the prop has slid onto the shaft taper. To ensure maximum contact between propeller bore and shaft taper, lapping-applying a mild abrasive to smooth out any surface imperfections to allow greater surface contact between the prop bore and the shaft—is recommended. To gauge the need for, or effectiveness of, lapping, first apply machinist&apos;s bluing compound to the shaft taper (in a pinch, indelible marker can be used). Then, coat the shaft taper with automotive valve-grinding paste, again without the key installed. Push the prop onto the shaft. While applying light forward pressure, rotate the prop 90 degrees to the left, 90 degrees to the right, and then 180 degrees to the left and then to the right. Repeat this left-right rotation several more times. Remove the prop, clean off the valve grinding compound (it&apos;s usually water soluble), and check the bluing. Ideally, 75 to 80 percent of the bluing will be gone, exposing the shiny, silver shaft taper, meaning that you achieved 75 to 80 percent contact between the shaft taper and propeller bore. It may require a number of rotations to achieve the desired contact; however, it&apos;s worth the effort. Maximum contact with the shaft taper means the prop will stay put. If the prop does not fully engage the shaft taper, it may rock and eventually loosen the retaining nuts. After the lapping is complete, check the line you drew earlier on the shaft. You&apos;ll probably notice the propeller hub now covers the line because of the improved fit. Draw or scribe a new line where the forward end of the hub now rests on the shaft. Remove the prop and ensure that bore, shaft taper, and both prop and shaft keyways are clean and free of all valve-grinding compound. Next, lightly coat the shaft taper and key with low- viscosity oil, such as automatic transmission fluid. 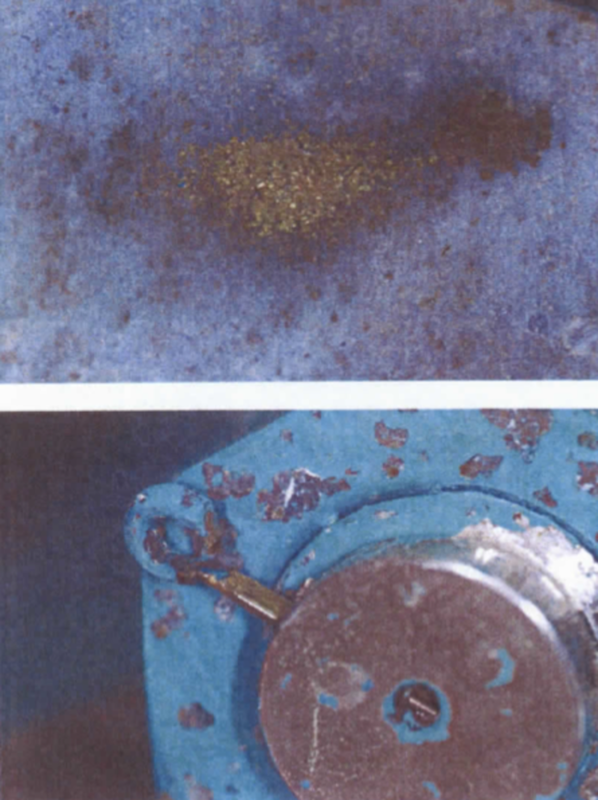 Never use grease on a propeller bore or shaft taper. A light lubricant is meant to ensure that the propeller fully engages the taper and key without binding. The lubricant is not meant to aid disassembly. In fact, many prop shops frown upon the idea of using any lubricant on a taper, no matter how light or little. Applying grease to a taper or bore may, in fact, prevent full engagement of the prop. 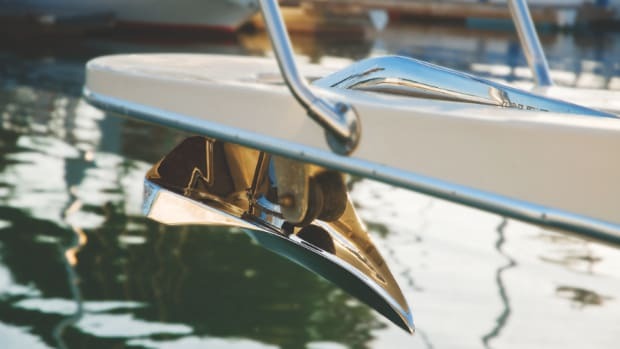 Because it is highly viscous, and a liquid of sorts, it&apos;s possible that the grease may hydrolock the propeller, preventing it from fully engaging the shaft taper. The bottom line is that you want the propeller to become well and truly stuck on the shaft taper. You, or someone else, can worry about removing it later. Left: Although not nearly as accurate as computer analysis, "sticking" a prop can be a good indicator of gross blade and shaft damage. Right: A close-up of a propeller shaft taper and key. Grease was used during the installation of this prop, and the prop was not lapped. The combination of the two errors allowed the propeller to rock back and forth on the taper, damaging both the shaft and propeller keyways. Once you&apos;ve placed the prop on the shaft, make sure that it aligns with the second line you scribed on the shaft, the one that&apos;s farther forward. Then, spin the largertwo propeller nuts onto the shaft&apos;s threads and draw it up tight using a proper nut wrench, not a pipe wrench. Most propeller nuts are made from relatively soft copper alloys such as brass or bronze. A pipe wrench, which is designed to clench and spin pipes rather than nuts, will simply mutilate most propeller hardware. Many do-it- yourselfers and boatyards use pipe wrenches because they are handy, available, and among the only wrenches that will fit a large nut. But that doesn&apos;t make them right for the job. “Why not just use a harder nut, like stainless steel,” you might ask. True, these nuts would be less affected by a pipe wrench&apos;s aggressive teeth. 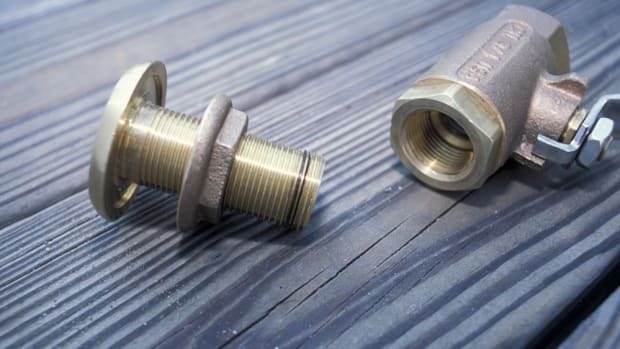 However, if your shaft is made from stainless steel or an alloy of stainless steel, the nuts should be manufactured from a softer material to prevent galling—a process that overheats the threads as the fastener is tightened, causing them to eventually strip. Large wrenches that look very much like a pipe wrench, but whose jaws are smooth rather than serrated, are readily available from many tool suppliers. Once you&apos;ve spun the large nut on, place a soft wood block between the vessel&apos;s bottom and the edge-leading edge for right-hand rotation props, trailing edge for left-hand rotation props—of one of the propeller&apos;s blades so that the blade is on the upswing, traveling toward the hull. This will hold the prop stationary as you torque the nuts. Hand-tighten the nut as hard as you can without using pneumatic or other power beyond your own. Then, remove the large nut. That&apos;s right, remove the large nut and install the smaller-thin or half-height-nut in its place. (By installing and tightening the larger nut first, you&apos;ve ensured that the propeller is fully seated onto the shaft-an important part of correctly installing the screw.) Tighten the smaller nut as much as you can, and then reinstall the large nut behind it. While this may sound backwards-most folks think that the smaller, or locking, nut should go on last-in fact it&apos;s the other way around. Here&apos;s why. When the large nut is installed first and tightened down, it&apos;s bearing the entire load on its threads. When the second, smaller nut is then installed and tightened, it relieves-or unloads—the pressure from the large nut&apos;s threads, transferring it to its own, fewer threads, which makes little sense from an engineering standpoint. Reverse the order, however, placing the smaller nut on first, and the larger nut, which now carries the lion’s share of the tension, then unloads its threads. The Society of Automotive Engineers (SAE), USCG, and many other engineering and maritime organizations specify this seemingly "nutty"-but correct-order for thicker and thinner nuts. Finally, install a cotter pin of the proper size and material and bend its halves fully apart and 180 degrees over. The proper size means it just fits, preferably snugly, in the hole drilled in the end of the shaft, rather than being a loose or sloppy fit. A loose cotter pin will tend to rattle around and chafe, and will eventually fail. The proper material for cotter pins is stainless steel, period. Never install a brass cotter pin in any shaft, particularly a stainless-alloy shaft. The reason is that the zinc content in brass will cause the pin to rapidly corrode and disintegrate, particularly in this turbulent environment. This scenario is accelerated when a brass cotter pin is in contact with a more noble metal, such as stainless steel or an even nobler proprietary shaft alloy. 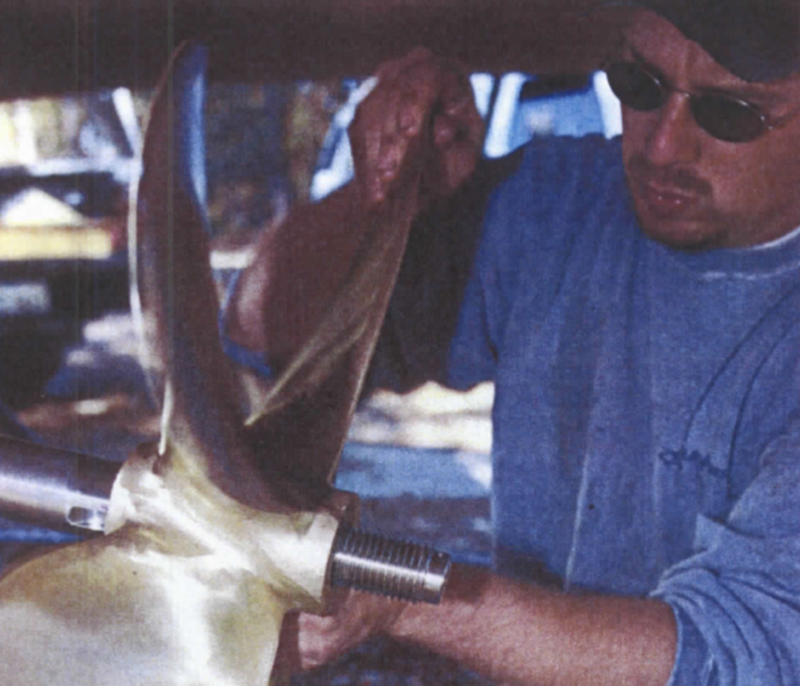 At some stage in the life of your vessel, the time will come for propeller repair or simply a tune-up. If you have never hail your prop removed and checked by a prop shop, then it&apos;s probably time, even if the prop shows no obvious signs of damage. Many new propellers arc poorly balanced straight from the factory (or are damaged in transit). So even if your boat is relatively new, chances are good that the prop could stand some level of attention. In my experience as the operator of a boatbuilding and service yard, about 40 percent of new props require some work-and I tend to purchase only high-quality props from reputable manufacturers. The portion needing work jumps to 90 percent for poorer-quality props and for props already in use. Reputable propeller shops that use recordable and verifiable means of propeller analysis (more on what this means in a moment) often will assess a propeller&apos;s condition at no charge. Thus, you&apos;re on the hook only for the propeller removal and reinstallation, and that&apos;s usually nominal. How do you choose which propeller repair shop to patronize? My criteria for propeller repair and adjustment is verifiable accuracy that meets a recognized standard, as well as general good business practices. The first rule in finding the right vendor is one of geography-the nearest shop is not always the best shop. For several years, I used UPS to send all of my propellers to another state-or drove them myself-because I wasn&apos;t satisfied with the accuracy of work done by the local vendors. The interface between the propeller and shaft taper is critical. Machinist&apos;s die, the red coating, functions as an indicator during the propeller/shaft lapping process, enabling techs to ensure maximum contact between the two components. A poor fit between the two tapers may cause prop wobble or loosening. 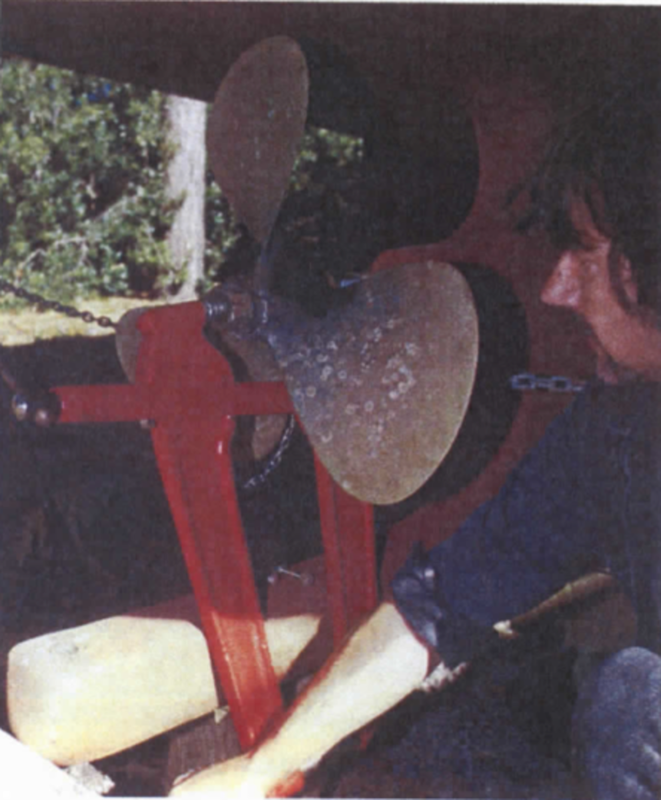 Before the advent of Prop Scan and other systems like it, propeller repair shops used what is known as a pitch block to repair a propeller. The pitch block is a die of sorts that matches exactly the pitch face of the propeller blade for every type of propeller manufactured. 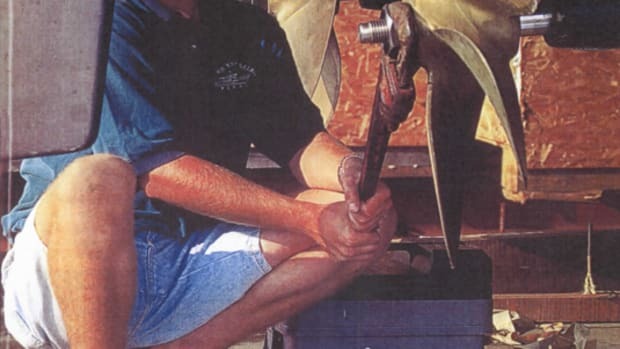 A technician repairing a damaged propeller using this tool beats on the blade with a hammer until it once again conforms to the pitch block. The system is crude, but it works, and many propeller shops still use this technique successfully. Pitchometers are also used as a manual means of assessing pitch, and inconsistencies thereof, at a given number of radii on each blade. (Radii are usually expressed as a percentage distance from the center of the prop hub, usually beginning somewhere about 30 percent for the part of the blade closest to the hub, and in increments to 95 percent, close to the blade tip.) This is simply a measurement tool that gauges the distance of the propeller blade from a fixed point along each radius. The figures are then recorded onto a chart for later assessment. It&apos;s a tedious and time-consuming process, but it does yield useful results. The digital, computerized propeller measurement system, on the other hand, measures pitch to within .001 inches and blade surface inconsistency to within .004 inches along every degree of pitch, meaning from the leading to trailing edge of the blade. This level of accuracy is far beyond the pitch block and considerably quicker, if not more accurate, than the pitchometer. With the digital information recorded and stored in a computer program, a graphic representation of the propeller&apos;s health is then produced. The bar graphs and numerical figures displayed on a computer screen guide the technician through the adjustment of each blade on the propeller. The assessment process begins by installing the propeller (the Prop Scan system used by Wildcat can accommodate propellers from 7 inches to 11 feet in diameter, and from two to seven blades) on the Prop Scan table. This is an extremely rigid, heavily built, steel platform that supports the propeller, allowing it to rotate on precision bearings with single finger pressure. The radii are scribed into each blade at the desired intervals, beginning at between 30 percent and 50 percent from the center and then every 10 percent thereafter, sometimes including 95 percent or the outermost tip of the blade. The Prop Scan technician then rotates the propeller by hand while allowing a sliding vertical shaft equipped with a small steel wheel to travel along the blade. The shaft sends a digital signal to a Prop Scan computer program that processes the information, converting it to measurements of pitch, pitch progression, and hydrodynamic consistency (the trueness of the-blade surface). Once the condition of the prop has been assessed, the technician then moves the prop to another table equipped with a pneumatic ram. The ram applies several hundred pounds of pressure, rigidly securing the propeller to the table while the propeller is adjusted. The adjustment for smaller propellers- those under about 30 inches in diameter—is strictly an application of brute force, although it&apos;s applied with a large degree of finesse. The manual tools of the trade are a series of hammers whose heads range from soft rubber, lead, copper, and brass to hard stainless steel. For larger propellers, pneumatic pistons can be used to bend, torque, and tweak a propeller&apos;s blades. Still, this is a hands-on business practiced by those who are able to artfully swing a mallet and wield a disc grinder. Once the technician has finished with your prop, he or she has checked and adjusted its pitch, diameter, and hydrodynamic properties as well as its physical balance. After the heavy work is done, the prop is sanded and dressed smooth using a range of abrasives from 36-grit (about equal to coarse sand) to a Scotchbrite pad (something like a dish scouring pad). At this point, your propeller is as right as it&apos;s ever going to be. The standards adhered to by those using Prop Scan equipment are defined by the International Standards Organization (ISO). Created in 1981, the ISO propeller standard is, by Larry Carlson&apos;s own admission, not quite perfect for the types of propellers he works on recreational, commercial, and small military vessels-however, it is a rigid guideline set forth by an independent standards body. 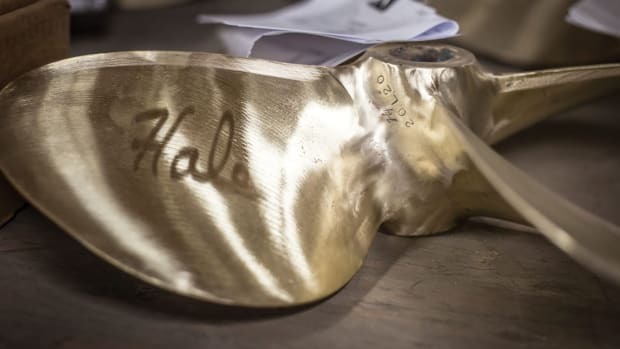 When Carlson first got into the business, he inquired of a prop manufacturer&apos;s representative as whether the manufacturer built its props to any particular standard. "Yes," the representative responded, to which Carlson asked, "Which one?" "Our own," came the reply. Carlson thought he was making progress. Knowing he needed some guideline that he could follow when repairing propellers manufactured by this company, he asked, "Can I have a copy of the standard to use when doing repairs?" To which the representative replied, "No, I&apos;m afraid not, that&apos;s proprietary information." That cinched it for Carlson; he began to search for a solution. Prop Scan and ISO were it. Adherence to the ISO standards is entirely voluntary for service and repair of recreational-vessel propellers. Not every prop shop follows the ISO standards; however, all facilities using the Prop Scan system are obligated to toe the ISO line. The overall ISO standards are designated as 484/1 (props larger than 8 feet) and 484/2 (props smaller than 8 feet). (Officially, the standard only applies to props 31 inches and larger; however, Prop Scan applies the standard to the all the props they service, as small as 7 inches.) The various classes of conformity within this standard range from O, which is used for submarines (extremely precise) to classes S, 1, 2, and 3-in descending order of accuracy. S would be reserved for high performance recreational and military craft, although any prop could be tuned to this standard, for a price. The recommended standard for fast and displacement trawlers is class 1, with class 2 reserved for workboats and vessels that operate regularly in shallow water, where propeller damage is likely to occur. Class 3 is quite low and not recommended for any recreational vessel. The difference between each class represents an order of magnitude of 50 percent. That is, class S has a 50 percent narrower tolerance than class 1, class 1 has a 50 percent narrower tolerance than Class 2, and so on. I&apos;ve used the Prop Scan system through Wildcat Propellers for nearly 5 years and I&apos;m pleased with the results. When my yard is troubleshooting a vibration problem, I must have absolute confidence that, once the prop&apos;s been checked and serviced, the propeller can now be ruled out as the culprit. With a propeller that has been serviced with Prop Scan, I&apos;m confident that&apos;s the case. Proper propeller selection, installation, and service will ensure that the horsepower produced by your engine is used as efficiently and economically as possible. Pay attention to the prop, take care of it, and it will serve you and your vessel well. 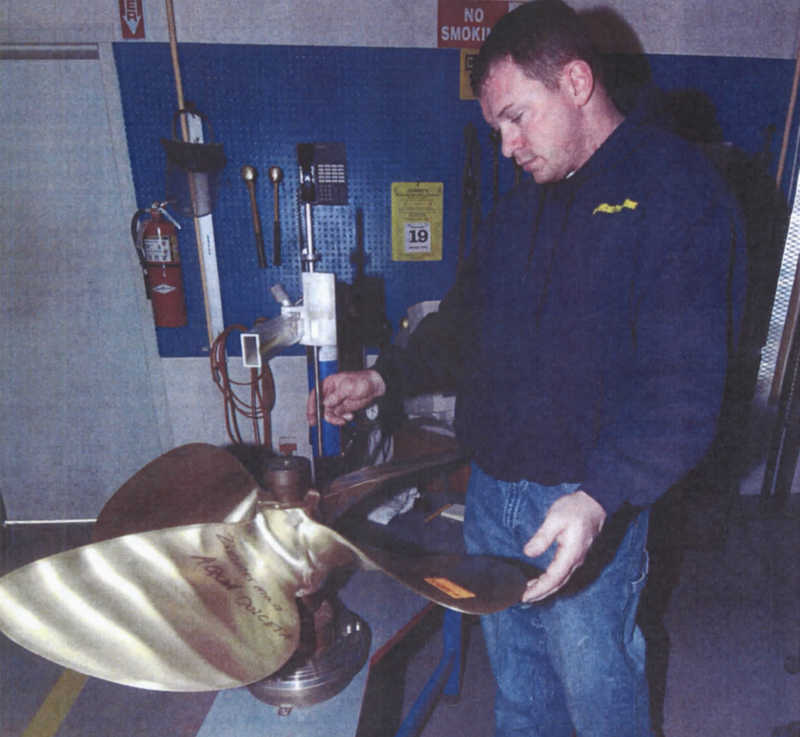 Wildcat Propellers repair technician Troy Erb measures a propeller using the Prop Scan system.